Cut a lengthwise slit down the centre of the pork fillet to within 2cm of bottom then open fillet so that it lies flat on a chopping board. Cover with cling film then using a rolling pin flatten to a 2cm thickness then discard the cling film. For the stuffing make breadcrumbs by tearing the bread and place in a food processor, blitz for a few seconds until the bread resembles fine breadcrumbs. Alternatively finely grate the bread. Put the breadcrumbs into a large mixing bowl with the remaining stuffing ingredients. Season with black pepper and mix well until all of the ingredients are combined. Divide the fillet into two portions then place the stuffing evenly along the centre of both fillet portions. Roll up each fillet, starting with a long end then using kitchen string tie up the fillets at 5cm intervals. At this stage one stuffed fillet can be set aside for freezing. Place the remaining fillet in a small roasting pan, season with black pepper then pour over the cider. Cover the tin with foil and place in the oven for 35 minutes. Remove the foil during the last 10 minutes of cooking. Transfer the pork to a warm plate to rest and pour the cider juices into a small saucepan. Bring to the boil then simmer gently for 5 minutes, remove from the heat and whisk in the crème fraiche. If the sauce is not thickened just return to the heat for a few minutes and simmer. Slice the pork into 6 even pieces and serve with the cider sauce. This recipe is delicious served with creamed potatoes and seasonal vegetables. 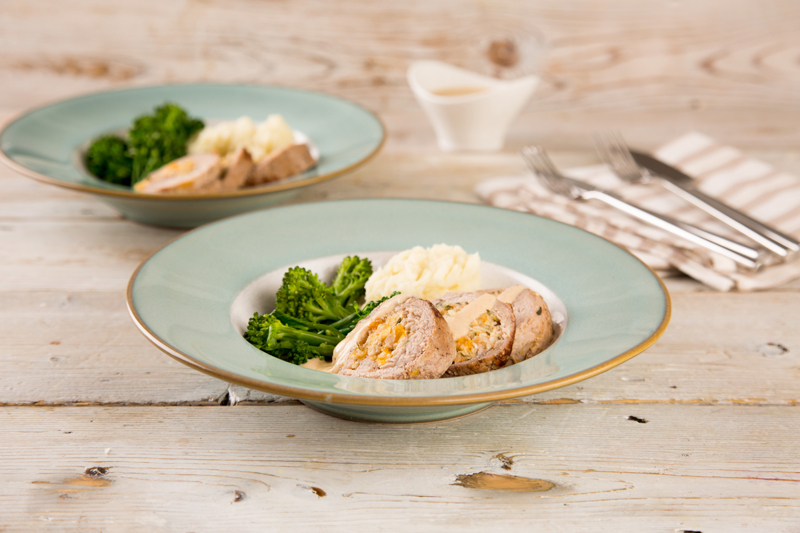 You could use the second fillet roll for a small Sunday roast or midweek tea served with gravy, potatoes and vegetables. The stuffing can also be served rolled into balls then baked with pork chops. To use up any leftover cider poach some apples in cider and top with a crumble mixture for a delicious twist on an apple crumble. Vegetarian Options The stuffing can be made into balls and can be served with a vegetarian nut roast. Freezing and Storage Tips Suitable for freezing. Defrost in the fridge and cook as directed in the recipe until piping hot. Store any leftover cooked chicken covered in the fridge and eat within 48 hours.